The following comments come from E.G. 's presentations' evaluation forms and E-mail feedback. While some of the feedback (on the feedback forms) was anonymous, some participants provided written permission to use their initials or full names along with their feedback. Awesome information - Please bring back! Supervisors and managers should be highly encouraged! Great Speaker, very Knowledgeable and made learning fun. LOVE the CLASS. Thank You! Very informative, Great Speaker, easy to listen to and relate to. Thank you! ENJOYED THIS CLASS VERY MUCH. A workshop that reminded all of us that everyone is motivated differently and helped us better understand different people with different personality types. E.G. 's style appeals to all types which encourages participation with everyone. This presentation brought me to the understanding how everyone is wired differently and to be aware of these differences. I learned to respect and better understand my coworkers. A presentation that I highly recommend for any group. I don't want to say that your presentation was informational - it was rather TRANSFORMATIONAL. Now I have a more in-depth understanding of why my employees behave the way they behave, and I can clearly see that they have a better understanding of my communication (and management) style. It definitely changed the whole dynamics of the workplace. A belated thanks for the seminar! It was helpful for us, and I will continue to suggest that the whole staff could benefit from attending this session or other topics. Thank-you for the opportunity to attend your entertaining workshop. I certainly had an enjoyable experience today and learned some useful concepts, too. Definitely a must-attend event for social workers. After this presentation I have a much better understanding of my clients behavioral tendencies. Thank you for a very informative and entertaining presentation. A wonderful session that helped me learn how to better manage and motivate my staff. Would I recomend this to others? Yes, Do it! 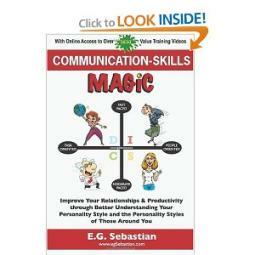 A great presentation that helped me understand how to better communicate with different types of personalities. A very enjoyable and informational workshop that showed me how to deal with people with different personalities. A wonderful learning experience! I enjoyed learning more about the people I work with and being more open and receptive to [individual] differences. I enjoyed discovering my personality type and finding out my coworkers personalities. A very enjoyable presentation where I learned how to better interact with my coworkers. This session helped me better understand who I am, as well as better communicate and interract with my coworkers. "...very enlightening! You can learn about yourself as well as others." I must thank you for enlightening me concerning who I am. Before being exposed to the DISC theory, I was convinced that I had something wrong with me because it seemed like everyone in my family possessed a controlling uncompromising personality. I couldn't understand why I couldn't become tough and forceful the way they are and not care. Of the seven siblings (all older than I am), I could relate to only one and he is now deceased. I had given up on the remaining four, and I was about ready to withdraw myself from them completely. Again, thanks for helping me to understand ME. I really enjoyed and appreciated meeting you and hearing you speak. It was perfect and what I learned has been helping me already. A very interesting and helpful presentation. It helped me understand and distinguish between different personality types and how it applies to children and each type's needs. This workshop helped me recognize to a greater degree the various [children's] personality types. I highly recommend it to anyone working with children. It was very informative and interesting. It was great. Have some more! I learned not only how to better help children succeed, but I also learned about my own personality traits. I learned to identify different personalities in children and adults, and learned how to most effectively communicate with each type. This is some information that I can apply immediately in my field. A great opportunity to learn more about yourself and those you interact with every day. It helped me better understand myself and better understand my students, hopefully to make me a better teacher to each child.